Decrypto is a fascinating communication game where teams compete against each other to relay information to each other while not allowing the other team to intercept that same message. I first played this game in April 2017 at the Gathering of Friends, and we probably played the game six or seven times in a single weekend. 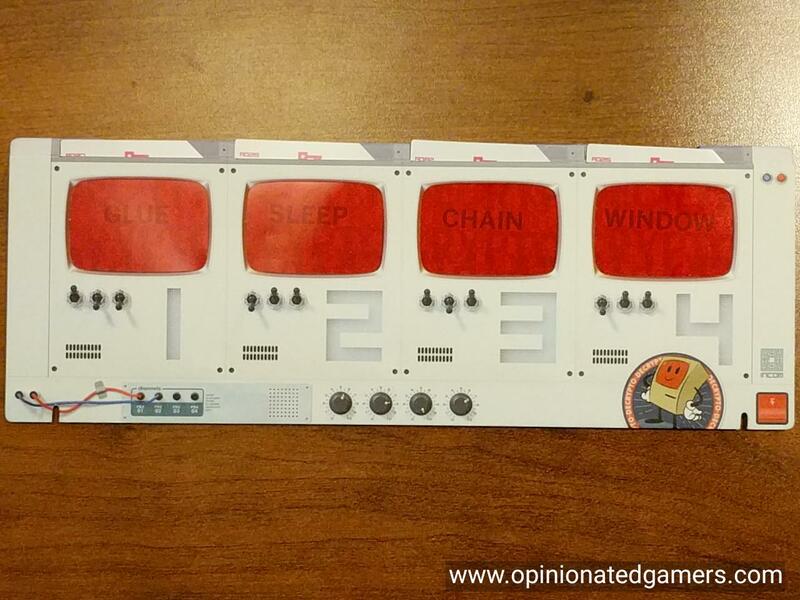 Each team gets a dashboard with four red film windows. In each of these numbered slots, a word card is placed so that your team can read the words. One player on each team is the designated clue giver. He draws a card from the clue deck (which has 24 cards, one for each ordered permutation of three windows). His job is to now give clues to get his teammates to identify the correct sequence of numbers on his clue card. When the clues are ready, the giver reads them aloud so that both teams can hear. and now you can read them! Clues can be of almost any form – they can be single words, phrases, sentences, songs, dances, whatever. You cannot use the actual word (or part of the word) as a clue. You also can’t use rhymes as clues nor use a clue which references its position on the dashboard nor the spelling nor the number of letters in the word. That is – the clues have to refer to the meaning of the keywords (because otherwise it would be impossible for your opponents to try to steal them. The clues must also use public information – you cannot use private or inside knowledge as a clue. You may not use the same clue twice in a game. Each team has a sheet on which they can write down the clues and the answer guesses. In the first round, only the clue-giving team gets to make a guess at the combination (and they have the advantage that they can look at the four target words on their dashboard) – but in all later rounds – both teams work to decipher the clues to guess the order on the clue card. Once both teams have signaled that they have a guess at the combination, both answers are read out loud, and then the clue giver gives the correct answer. If the clue giving team guesses incorrectly, that team gets a penalty marker. If they guess correctly, nothing happens – though – as they were able to look at the target words, you’d expect them to usually get it right… If the intercepting team guesses incorrectly, nothing happens. If they are able to guess the write number combination, they get a positive scoring marker. Now, the other team gives clues for their set of words, and the guesses are scored in the same manner. At the end of the round, a team wins if they have 2 Interception tokens. A team can also lose if they have acquired 2 Penalty tokens. If there is a tie (whether one team has 2 of each type, or both teams have two of the same type), then each team calculates their score with each positive marker being worth +1 point and each penalty marker being worth -1 point. The team with the highest score wins. If still tied, each team tries to directly guess their opponent’s four words on their dashboard. The team that guesses the most correctly wins. There is also a three person version of the game where players take turns acting as either the clue-giver, clue-answerer or interceptor. The game is won by the interceptor if he gets two points (either a interception of the message or a miscommunication between the other two) in the first five rounds of the game. The rules are pretty much the same otherwise. Decrypto is a fascinating and enthralling word game. It is one that rewards clever wordplay and clue giving, but you can’t be too clever because your team will lose the game if they can’t decipher your clues. The challenge of the clue giver is devising good clues as well as managing the order in which they are given. There are plenty of great clues to communicate to your teammates – who can also read the keywords – but the clever part is coming up with clues that will make it difficult for the message to be stolen. In the team sense, it’s a wonderful game for communication and collaboration. With larger teams, the clue giver can sometimes really come up with obscure clues because he has more chances for someone to get the right idea from the clue. The discussions between teammates can get quite animated around here, and that aspect is one of the best parts of the game for me. Our group definitely enjoys trying to guess the Keywords at the end of each game, and we do this whether or not we need to do so for the tiebreaker. Trying to decipher the keywords is a necessary part of trying to decrypt your opponent’s clues, and it’s always fun to see how successful you were in guessing the right keywords or if you were just plain lucky. The components are well done. The dashboard is sturdy and not prone to falling over accidentally. One dashboard is white and the other is black – to identify the two teams. The answers sheets have a white and a black side to help you write the information in the correct areas. 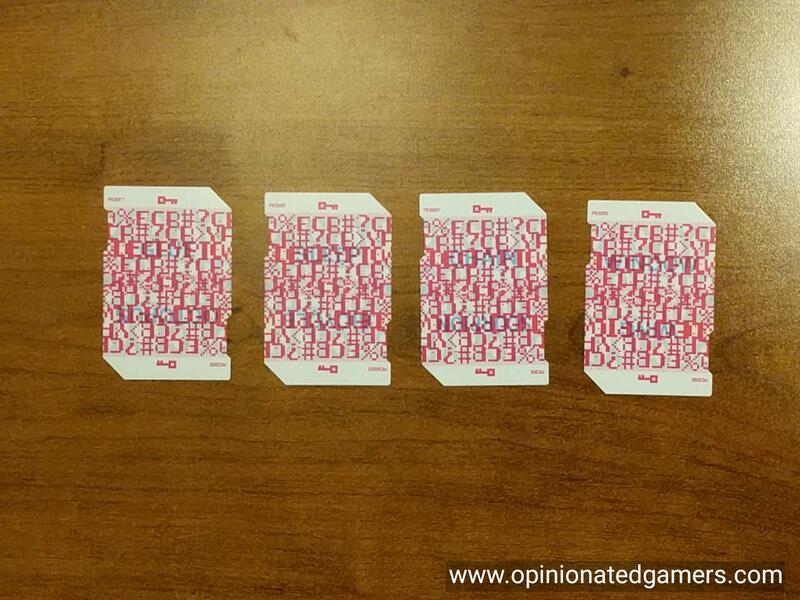 The keyword cards have a nicely done overlay of printing so that you cannot easily read the keywords by mistake. This has been one of my favorite games from this past year. It was definitely amongst my most anticipated. As much of the game revolves around clever clues and deciphering those clues, this is not the kind of game that can be played by anyone/everyone, but in the right group, this is one of the best in the genre. For me, it will end up in the same group as Tichu, Montage, and Crokinole – a permanent part of my collection, but one that needs the right group to shine. But when that group is around, this is one I would always suggest playing (at nearly every possible opportunity). 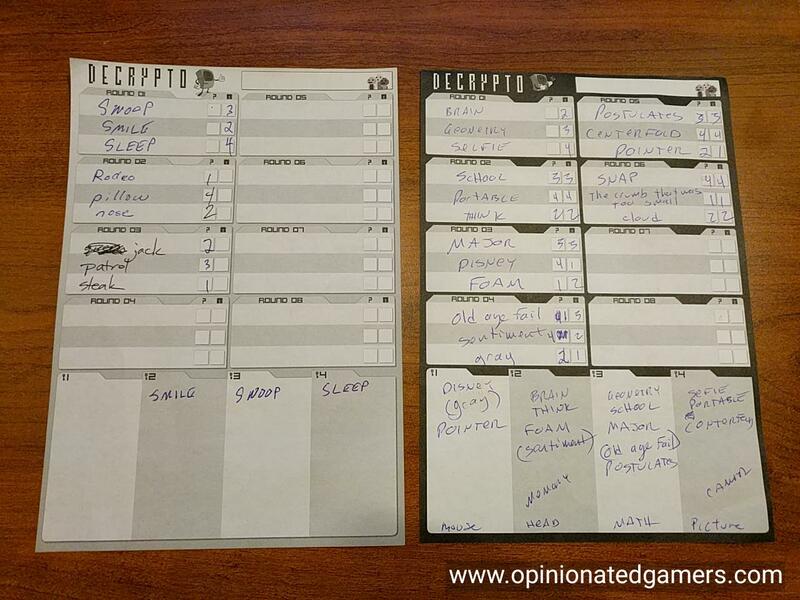 Erik Arneson: I also played the prototype several times at the Gathering of Friends, and I concur with everything Dale said. Decrypto is a great game. I can’t wait to get the finished version. Alan H: Another Gathering player for me too. The game was just great fun to play and my group was fantastic to play with. Part of the fun for some party games is when you have people who don’t know each other too well or (even better) live on either side of the pond. This leads to different understanding of specific words and different interpretations. You start realising the problems this causes and then try to adjust to get the other person’s viewpoint. Or fail and laugh. All of these things happened and made me realise how much fun the game is with the right group. So I would agree with Dale on that point. Did you hear the one about the Frenchman, the American and the Englishman? No? Well try Decrypto with that set. Joe Huber (1 play, of the prototype): I concur with everything Dale said about the quality and cleverness of the game. But – it’s not my type of game, and it wasn’t that rare game that shines through for me in spite of that. Or, in other words – I’m not part of the right group Dale’s looking for. But that’s no fault of the game. James Nathan (2 plays): I’ve played one 3 player game and one 8 player game, and it’s just great. In a game yesterday, we needed to clue one of our words in each of the first 6 rounds – and rather than the Celebrities’ style clue trend where you pick a path and sort of dig in, here the opposite happens: if you don’t vary the nuance of the word that you are clueing off of, the other teams will intercept your signal. As such, keying a word 6 times in a row means you need to derive quite a few different interpretations or references to the word. As Dale said, it can be clutch to have a large enough team that someone will rescue your crappy clue, and big props to our teamwork yesterday, as there were several clues that were about to go sideways before one teammate or another stood their ground on a certain interpretation and was proven right. The game should be available this summer – if you want, you can click here and pre-order it or add it to your wishlist! Wow, word games continue to make a comeback! 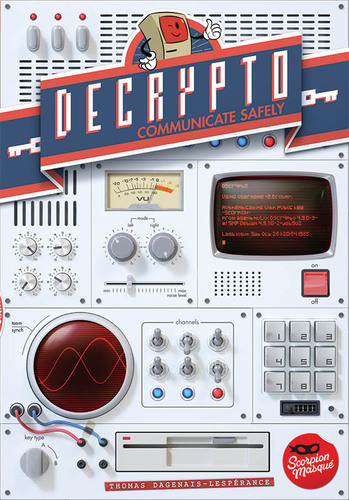 Just when I thought there was no more room for clever game design in the genre, we have Codenames, Werewords, Wordsy, and now Decrypto! The only downside is when you play in international groups most of the time as I do. Some people may be handicapped by the language of that particular game. 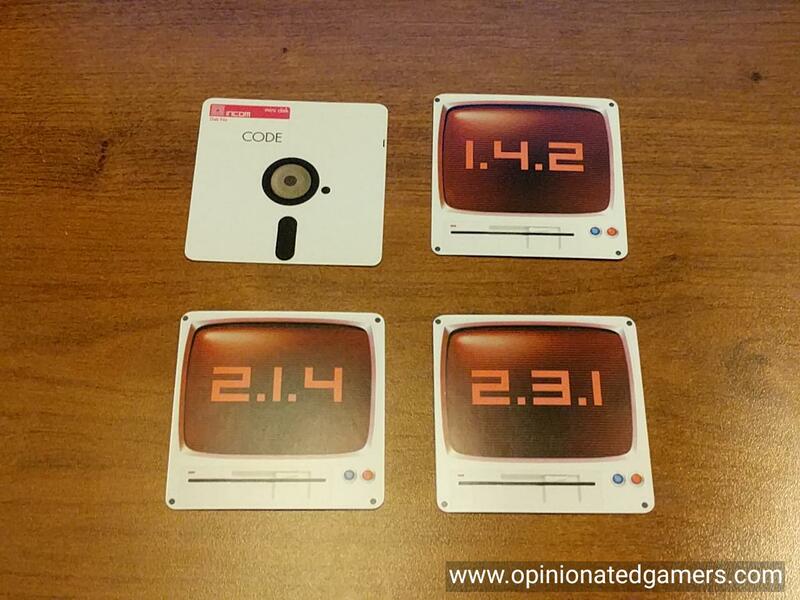 And like Codenames, I may have to buy both the English and German versions of this game! I also think this won’t have the broad-based appeal of Codenames as it just has a lot of rules, relatively speaking. But it’s an excellent game for a more gamer-y group. This is an interesting premise! I love word games and cooperative team games. Thanks for sharing!